Learn everything about Entre Deux Mers Bordeaux wine, with a history of the Entre Deux Mers appellation, the character and style of the wines, and a wine buying guide with detailed, profiles on the best producers in the appellation with wine tasting notes, wine and food pairing tips, histories and information on the vineyards and winemaking. Entre Deux Mers takes its name from its location, which is a large, triangular, shaped region situated in the middle of two bodies of water, the Garonne river to the south and the Dordogne river to the north. During the 18th century, when Bordeaux was being widely planted, the wines from Entre Deux Mers were much more, popular, sought after and expensive than they are today. In fact, Entre Deux Mers was once responsible for producing more white Bordeaux wine than red Bordeaux wine. Entre Deux Mers is situated is just south and due east of the city of Bordeaux. The Entre Deux Mers appellation has 2,400 hectares under vine and close to 10,000 hectares of land in total, making it the largest appellation in Bordeaux. There are at least 250 different producers in the Entre Deux Mers region. Most estates in the Entre Deux Mers appellation are large. But it was not always that way. Due to increasing difficulties in selling generic Bordeaux wine, regions like Entre Deux Mers continues to see increased consolidation. For example, in the 1970’s, the average vineyard in Entre Deux Mers was at least 7 hectares. By 2015, that figure jumped up quite a bit. By 2015, each chateau had on average close to 60 hectares under vine! On average, close to 1 million cases of wine are produced each year in Entre Deux Mers. To place the name of the Entre Deux Mers appellation on your label, your wine must be a Bordeaux Blanc. Red wines produced from grapes planted in the appellation are sold as either generic Bordeaux, or at their best, Bordeaux Superieur. The Entre Deux Mers region has one of the longest histories as a wine producing area in France. In fact, Entre Deux Mers dates back almost 2,000 years which was when it was first planted to grapevines by the ancient Romans. But Entre Deux Mers earned its reputation due to the wine produced by Benedictine Monks during the Middle Ages. At first, the Monks began producing wine in Entre Deux Mers for religious purposes. In 1079, the Monks, led by Saint Gerard de Corbie, constructed the Abbey of La Sauve Majeure, which took its name from the Latin term, granda silva, which means large forest. That phrase accurately describes much of the Entre Deux Mers region as close to 75% of the region remains unplanted, due to the dense greenery. The remains of the historic Abbey can still be seen today. It’s been declared a protected Unesco historical site. Entre Deux Mers is an attractive area to drive through. Many of the chateaux located in Entre Deux Mers are stunningly beautiful and are as impressive as many of the best Classified Growths in the Medoc. One of the most interesting estates close to the region is Chateau de Rastignac, which was designed as a tribute to Thomas Jefferson to look like the White House, in Washington DC. The top 10 important facts you need to know about Entre Deux Mers. #1 Entre Deux Mers is named after its geographical location, which is situated in the middle of two bodies of water, the Garonne and the Dordogne rivers. #2 Only white wines from the appellation are labeled as coming from Entre Deux Mers. #3 Entre Deux Mers includes 9 different AOC Bordeaux appellations. #4 Entre Deux Mers produces dry white Bordeaux wine, red Bordeaux wine and sweet Bordeaux wine. #5 The best red wines from Entre Deux Mers are sold as Bordeaux Superieur wine. #6 Most of Entre Deux Mers consists of forest land, which is not suitable for growing grapes. #7 Entre Deux Mers was first planted by the ancient Romans. #8 Entre Deux Mers is the largest Bordeaux wine producing appellation at 10,000 hectares in size. #9 Even though the wine from Entre Deux Mers is humble, many of the most beautiful chateau in Bordeaux are located in the region. #10 Entre Deux Mers features a chateau that was created to look exactly like the White House in Washington DC. Perhaps the best known wine from the Entre Deux Mers appellation comes from Chateau Reignac. However, like all the best red wine produced in the Entre Deux Mers appellation, the wine is sold as a Bordeaux Superieur, due to its high quality. Other estates worth the effort to seek out are: Chateau Marjosse, Domaine de Courteillac, Chateau Gree-Laroque, Chateau Le Pin Beausoleil, Chateau Rauzan Despagne, Chateau Pey-La-Tour, Chateau Bonnet, Chateau Carignan, Chateau Hostens Picant and Chateau Thieuley are other examples of the better wines being made today in the Entre Deux Mers appellation. Several of the best growers with the Bordeaux Superieur designation come from the large, Entre Deux Mers appellation. Generally speaking, the best wines from the Entre Deux Mers area are the white Bordeaux wines, due to the regions naturally cooler terroir and its compact, sand and clay soils. However, there are sections where you can also find gravel and limestone. Part of the problem with the terroir of the Entre Deux Mers appellation is the lack of mineral elements in the soil and the massive amount of forest land. In fact, much of the appellation is not planted to the production of grapes as it’s inhabited by forest land and other greenery situated on a series of rolling hills. Due to its varieties of diverse mix soils and forest land, Entre Deux Mers is different than most Bordeaux appellations as much of the land remains devoted to producing other agricultural crops. Entre Deux Mers is susceptible to damage from hail storms. In August, 2013, the appellation lost close to 10% of its entire production due to severe storms. Several estates lost their entire crop. The main grape varieties planted in the Entre Deux Mers region are Sauvignon Blanc, Semillon and Muscadelle. Those varieties are used to produce both dry, white Bordeaux wine as well as sweet, white Bordeaux wine. The white wines of the Entre Deux Mers appellation are what the region does best. In fact, only the white wines are allowed to be called Entre Deux Mers. The best red wines of the region are sold as Bordeaux Superieur. The vast majority of wines from Entre Deux Mers are sold as common Bordeaux AOC wine or as simple Vin de Table, also known as table wine. For the production of red Bordeaux wine in Entre Deux Mers, Merlot and Cabernet Sauvignon are by far the most important grapes planted in the region. However, some producers in Entre Deux Mers have been experimenting with grapes that are not allowable by law. This means their wines must be sold as simple Vin de France wines. Chateau Thieuley has plantings of Syrah and Chardonnay. They sell their Syrah blend under the name of Chateau Thieuley Les Truffieres Syrah, which takes its name from the numerous Mycorrhizal oak trees they planted on their land which promote the growth of truffles. The Entre Deux Mers appellation includes 9 separate AOC designated areas. Similar to what takes place in the Medoc, Entre Deux Mers is counted as one of the AOC areas. The other communes that make up the appellation are: Premieres Cotes de Bordeaux, Sainte Croix du Mont, St. Macaire, Graves de Vayres, Sainte Foy Bordeaux. The communes of Loupiac and Cadillac are also part of the Entre Deux Mers appellation as well. Both those regions, Loupiac and Cadillac, are well known for producing affordable, sweet, white Bordeaux wine made from grapes attacked by botrytis, which is also known as noble rot. If the wines of Sauternes and Barsac are out of your budget, Loupiac and Cadillac are good sources for well priced, sweet, white Bordeaux wine. You can read full details on all of these and other, smaller Lesser Known Bordeaux Appellations. The best vintages of Entre Deux Mers are: 2016, 2015, 2012, 2010, 2009 and 2005. The vast majority of wines from the Entre Deux Mers appellation require drinking in the first few years after bottling. 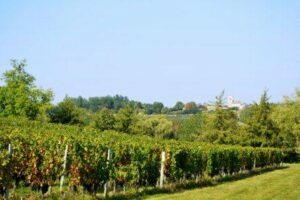 While the majority of the wines from the Entre deux Mers region are simple, easy to drink wines, there are some quality producers in the appellation region making both, red and white wine. But it takes effort to find the best wines, as most are not much more than simple, early drinking quaffers. Due to the low prices and poor overall reputation of the region, many producers are struggling to make a profit from their vines. In fact, during the 1960’s, as quality slid in the appellation, the wines for a time were all designated as simply, vin de table. While most white Bordeaux wines are aged in oak barrels after alcoholic fermentation, that is not always the case in Entre Deux Mers. Several producers in the Entre Deux Mers appellation make white Bordeaux wine that is fermented and aged completely in stainless steel tanks and do not see any oak in the aging process.